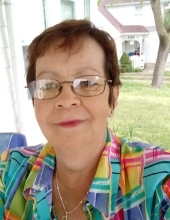 Lisa Ann Stieferman Hitt, 57, of Mexico, formerly of Jenks, Oklahoma, passed away on Saturday, January 26, 2019, following a valiant battle against cancer. She was born in Jefferson City, Missouri on November 23, 1961, the daughter of the late William Stieferman and Shirley (Hinnah) Stieferman. Lisa was married to Stephen “Jay” Hitt for 11 years, until his passing in 2015. Lisa worked in Social Services for the State of Missouri for 16 years prior to moving to Oklahoma. She enjoyed rock hunting and looking for arrowheads, doing historic research, gardening, cooking, singing and loved fishing. Lisa was an artist with crochet needles and could make anything. Her greatest pleasure was found in spending time with her family and friends. Memorial services will be held at 2 p.m. on Thursday, January 31, 2019 at Maupin Funeral Home in Fulton with Pastor Bruce Williamson officiating. Friends will be received from 12:00 p.m. until the time of service at the funeral home. Inurnment will be in Mokane Cemetery. Memorial donations are suggested to American Cancer Society or National Pancreatic Cancer Foundation, c/o Maupin Funeral Home, 301 Douglas Boulevard, Fulton, MO 65251. To send flowers or a remembrance gift to the family of Lisa Ann Stieferman Hitt, please visit our Tribute Store. "Email Address" would like to share the life celebration of Lisa Ann Stieferman Hitt. Click on the "link" to go to share a favorite memory or leave a condolence message for the family.